How’s your day today? Ugh I’m feelin’ a tad under the weather today with a migraine. Ouchie! I think I’ve been staring at my computer screen too long as I do my renewal accounts and it’s crossing my eyes…phew! But good news! 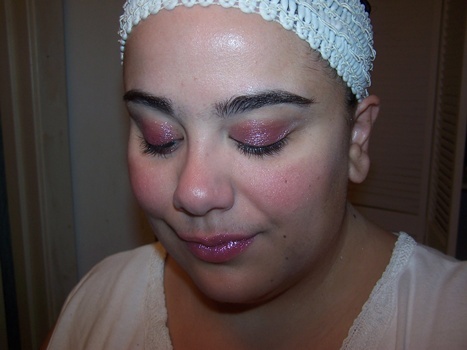 I have the Stila Jewel Eye Shadow Palette and Stila Jewel Lip Glaze to make me feel better! The colors have plenty of pigment but you do have to know how to use them as I heard a few rants how they have no color pay off, so not true, they pack plenty of color. I find the best way to apply is with a sponge tip applicator as this packs on color beautifully well. The colors all have a liquid-y look and feel as they look almost liked foiled liquid metal on my lids. Really gorgeous effect. The best way to describe them would be pressed MAC pigment or better yet pressed MAC Solar Bits. The texture and formula runs about the same as the MAC Solar bits in that it’s made up of flaky pieces of pigment but in a press shadow format. The potential for fall out could be great but I experienced no problems when I prepped well and made sure to pack on color with a sponge. Overall, the palette is well worth picking up if you like sparkly shadows. Absolutely love it! The Muse thinks you need one. It could be a tiny rant for some that the formula leaves behind a ton of glitter on your lips well after the gloss has worn away. This doesn’t really bother me much as a re-application is all I need to be back in shape. My fav shade was the Golden Topaz which gives my lips an incredible pop of warm topaz, it’s so lush! The shades are VERY glittery and VERY sparkly with a bit of a metallic finish, loves it! Overall, the formula isn’t as glossy as the normal Stila Lip Glaze formula but the amount of sparkle they contain more than makes up for it in my opinion. Stila Spring Collection 2010 injects a healthy dose of glittery, shimmery joy into the season. It does somewhat remind me of a Holiday Collection more than a Spring Collection but working the color collection correctly you can get some fun, elegant, and even warmer looks for the Spring season! Anyone haul any of Stila’s Spring Collection? 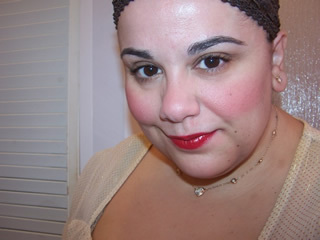 What are your lemmings from Stila Spring 2010? Hi Muse, today I cannot walk cause I started to work out after long months of doing nothing!! !lol…But I hope at the end of the day I can feel better and you too!!! You know I saw this palette at Sephora and din’t like the package (go figure…lol)!! Butttt…..I love the colors on you!! Its so pretty!!! I’m gonna buy it now!! Oh my…a good swatch can really make us thing twice about a product!! I’m so glad that the pigment is good and really has a lot of shimmery! Tks!! Have a great weekend!!! You are becoming my biggest addiction enabler!! And I love you for it!! I definitely need that palette – I love the colors, and the shimmeryness. The black would be good for a going-out-night smokey eye. I’m not a big fan of the lip gloss colors, but even if the colors were great I know I wouldn’t like them because of the glittery bits. Any lip gloss that has anything above a shimmer annoys me – I have the feel of the teeny bits of glitter on my lips. I like smoooooth. Hope your headache feels better! You have a migraine too? I’ve had one pretty much all day. It must be migraine day. That palette looks gorgeous but I’m not sure I’d see myself using it unless for special occasions. I’m not a big everyday sparkle person. You look lovely in those pics. I am curious. How did you like the texture of the shadows? Would applying them wet be too much (as if there could ever be such a thing to shimmer girls like us LOL)? aw thank you april *hugs* sorry for the delayed reply been swamped! hey betty! big time glittery fun 😀 mmmm no smell 🙂 no worries there! Aw thanks *hugs* Have you seen it yet? Sorry I was delayed replying so by now u might have hauled it lol! Hope your head is feeling better! I was thinking about getting them, but I already have so much makeup and the MAC Spring Colour Forecast does not make it any better….. I like them on you quite a bit and the reference to solar bits make my lemming even bigger… But I need to be a bit sensible, right? I mean, it least try? I was totally lemming the eye shadow quad after I say it online, but when I went to Sephora to finally purchase it ( after a long internal struggle) I was so disappointed by how small the quad was. I just could not justify buying it any longer. So of course I had to buy something else. It’s $32 as far as I know Juno. Oh wow those eyeshadows are gorgeous!! I have to get my hands on them! Love the light pink lip gloss too! This palette is amazing! I want this one sooo bad! I love the whole glittery look. it makes me feel like I’m at a party that never stops! The lip glazes reminds me of dazzleglass from mac. do you find they are about the same consistency? They sound about the same. Glittery but sticky. dazzleglass gives a lot of shine though because it’s super sticky..hmm debating if I should try these out. lol! 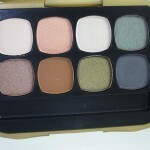 I hope I have a chance to check this palette out soon! Meep! So pretty! I really want that glitter palette and I’ve heard mixed reviews. I think its worth picking up though…some people don’t understand that using a sponge applicator is okay in some cases! Eugh, a bit too glittery for me by the looks of it. ^.^; I’m more of a matte person myself. I like the way it looks, but I think I’d end up a sparkly mess! Amethyst looks hot! del not bad fall out. good prep and a prime and I experienced none thankfully 😀 a sponge applicator helps BIG time! i forgot to add, very limited fallout from glitter! tia so glad to hear it, love it myself 😀 I agree def worth the splurge! I LOVEEEE this palette. I bought it back in (I think) January when it came out and I scooped up the only and last one! I was so happy. I was more excited about this than the UD Alice palette actually.. Thanks for mentioning sponge tip applicators. That never even came to me because I throw out all sponge tip applicators when they come in drugstore palettes but you’re RIGHT. That would work way better than a brush.. I’ve been using my fingers (eek!) I much rather use a sponge tip applicator than my fingers. I hope Stila makes more of these.. because they’re too amazing to be LE. Btw, the looks are amazing on you! where do u get them cheap!!!!!! if u still have this item can u sell it to me please love?